Axsun celebrates milestone with the beginning of its 10th year. Approaching 100 employees, 8 offices in North America, Multitude of services, Asset based equipment and implementation of SAP has made it an exciting time. We look forward to the next 10 years where we will continue our strategy and not remain seated on our laurels. Thank you to all our Customers, Suppliers, Employees and friends who have made this an exciting decade of services already! Today, Axsun launches additional double stack refrigerated containers in full operation for shipments between the U.S. and Canada, more than doubling its current reefer fleet. Shipping refrigerated goods via intermodal, can save shippers up to 30% versus traditional over the road service. Axsun increases its dry and Refrigerated fleet by more than 31%. Axsun is pleased to announce the opening of 2 new offices. The first Located in Anaheim California and the second in Charlotte North Carolina. Establishing these two new offices strengthens Axsun’s foot hold in the United States as we continue our expansion throughout North America. Powered with SAP technology and some of the strongest personal in the Transportation Industry, Axsun continues to provide a complete transportation solution including Intermodal, Trucking, Ocean, Air, and Warehousing services throughout North America. For more information visit www.axsungroup.com. Axsun is pleased to announce the opening of Axsun’s first United States office in Cary, North Carolina. Axsun is also pleased to announce the appointment of Mr. Thomas D. Craig as Executive Vice President for U.S. operations. “We’re excited to have Tom join us and lead the charge in our U.S. development “, states Mr. Steve Ramescu, President. “With Tom’s years of experience in the rail and trucking industry in the United States, we will be able to build an elite team bringing and leveraging the Axsun brand throughout North America.” Further U.S. office openings will be announced in the near future. Axsun has offices established in Canada, Mexico and now the U.S.
Axsun is pleased to announce the incorporation of Axsun in the U.S.A. Axsun is positioning its entrance into the U.S. market place. “We are excited and will be announcing shortly new office openings throughout the United States as we bring the Axsun brand to the domestic American market,” stated Steve Ramescu, President. Armed with some of the most knowledgeable people in transportation, and the strongest operating system in the market place with S.A.P. technology, this leverage positions Axsun to be a premier full service transportation service provider. Axsun solidifies new order of Refrigerated Containers doubling its current fleet size. These containers will be available for the Intermodal market place for the beginning of September. After our successful launch earlier this year with refrigerated cargo, Axsun Doubles its capacity for Cross border temperature controlled shipments offering shipper’s substantial cost reductions and a more environmentally friendlier way when compared to traditional truck shipments. Axsun reaches new milestone with now over 75 employees. Axsun’s Oakville office moves to its new facility. 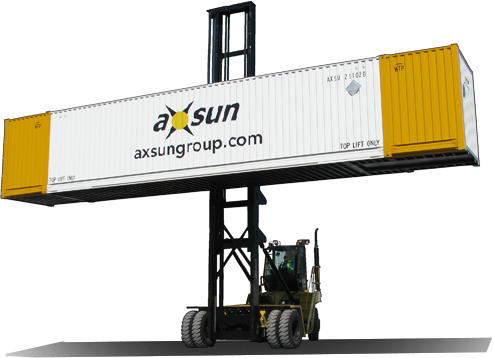 Axsun receives its initial purchase of Intermodal refrigerated double stack containers. Units arrived and are currently being fitted with Thermo-King. These containers will be designated for movement to and from the California, Quebec and Ontario marketplace and will allow shippers to enjoy savings of up to 40% when compared to traditional trucking service, while benefiting the environment with less carbon emissions when compared to truck. This service to start March 1. Axsun signs agreement to acquire more tractors through Garage Lagüe (an International Truck Dealer) for its long haul service. The delivery of these new tractors is to commence on March 1 2012. Purchase order is in place to increase Axsun’s fleet by more than 65%. Axsun acquires new office facility in Oakville, ON tripling its office space footage. Axsun to move into new facility March 1, 2012.